I recently tried this smoothie and thought it was pretty cool. Instead of a packet of oatmeal, I used 1/4 cup quick cooking oats. It's great how the oats adds a nice texture without calling too much attention to themselves. This is a terrific way to slip a serving of healthy oats into your diet... a satisfying, super fast breakfast-to-go. Big thanks to site user 'muffin' for sending us this one! This is so easy. Just place all ingredients in the blender and blend for a minute or so until smooth. That's all there is to it. Enjoy! 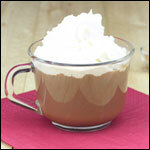 If desired you could add a pinch of cinnamon or a half of a pinch of nutmeg on the top for a flavorful garnish. When I saw my sister put a packet of oatmeal in the blender to make a smoothie, I told her she was crazy. But I really liked the texture (and oatmeal is so healthy). A week later I called her and asked what the exact ingredients were and this is what she emailed me. Mr Breakfast would like to thank muffin for this recipe. 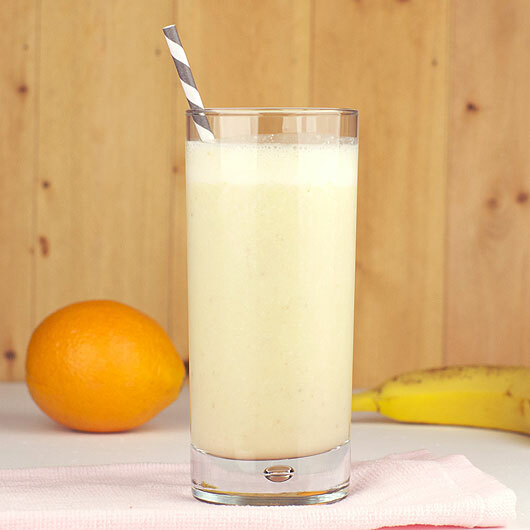 What do you think of Banana Oatmeal Smoothie? View all 24 comments for this recipe. 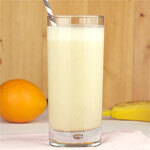 I do a variation with almond milk and 4 tangerines, frozen bananas instead of ice cubes. Very good. How many calories and fat do you think this is? I'm dieting and trying to stick to a 1300 to 1500 caloric intake per day and this sounds great for breakfast but would want to keep it within my limit. I added pineapple cubes (from a can) and it made it taste tropical. I'm going to always add a scoop of oats to my smoothies from now on. 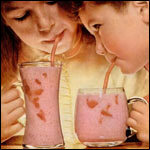 You don't really taste them, but I like how it makes the smoothie thicker. That was a good idea. Awesome. Thank you so much. I'm normally not a breakfast person but I really liked this! Is there a better substitute for orange juice? 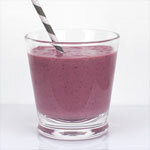 1/4 cup oatmeal should suffice or if you like your smoothies really thick, use 1/2 cup. If you have a good blender like the Vitamix, raw oatmeal will be ground into powder. 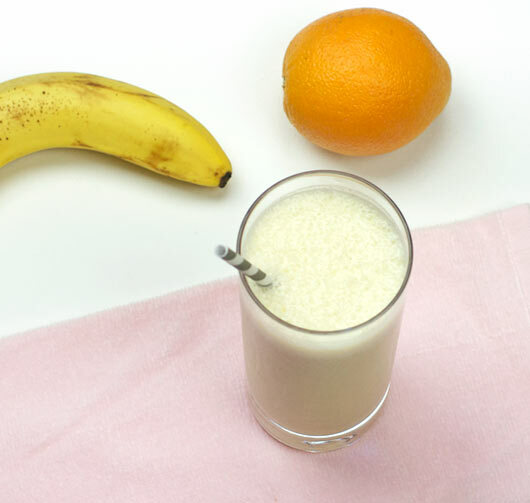 No need to cook it, actually cooked oatmeal in a smoothie sounds kind of gross. Is the oatmeal raw, straight from the box? 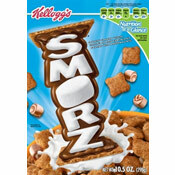 I saw BJ Penn eating this for breakfast on UFC Primetime. It looked like he was adding Whey protein as well. If this is what he is eating for breakfast, that's a pretty good endorsement. Last night I was watching PRIMETIME UFC with Bj Penn and George St.Pierre. They showed the guys getting ready for there up coming fight and Bj was doing the old oat meal trick in the blender. Never heard of it before so I checked online ;). About to have one for the first time now! I love oatmeal in my breakfast smoothies. It really gives it more bulk and keeps you satisfied for a long time. I just add half a cup of cooked oatmeal (made with water) and drop it in the blender with OJ and soy yogurt... mmmm mmmmm. All I can say is hoopla. This is great recipe; using things I normally have in the house. I used a frozen banana (chopped), 1/4 tsp vanilla and 1 tsp of cinnamon. It's a keeper! I used oatmeal cinnamon and apple. I followed the recipe exactly and it tastes great. This is great and very healthy. I used bananas and cream instant oatmeal and it worked great as well! Omgsh... I love this drink so much! It's almost like an orange julius! Thank you thank you thank you! When's the last time you had breakfast in a cup made of bacon? Click here.